MERIDEL RUBENSTEIN began her professional career in the mid 1970’s, evolving from photographer of single photographic images to artist of large-scale installations including, photography, video, and 3di works. These can be seen on her website: www.meridelrubenstein.com. She’s recognized for juxtaposing highly-charged materials and concepts to champion an awareness of how we are connected to place. Drawing multiple metaphors, she reconciles relationships between unlikely subjects that challenge our notions of place and reweave the tenuous threads that give meaning to our sense of belonging. Meridel has been a Visiting Associate Professor in Singapore at Nanyang Technological University's School of Art, Design, and Media. She maintains her studio in Santa Fe, New Mexico in the USA. She has exhibited widely including the Louvre, Paris; Museum of Contemporary Photography in Chicago and The List Center for the Visual Arts at MIT. This winter and spring/summer, she will have two solo museum exhibitions in New Mexico. A new monograph accompanies the forthcoming exhibition of ,Eden Turned on Its Side(2009-2107) at the University of New Mexico’s Fine Arts Museum February 2 –June 156, 2018, curated by Dr. Shawn Michelle Smith at FROM the School of the Chicago Art Institute. 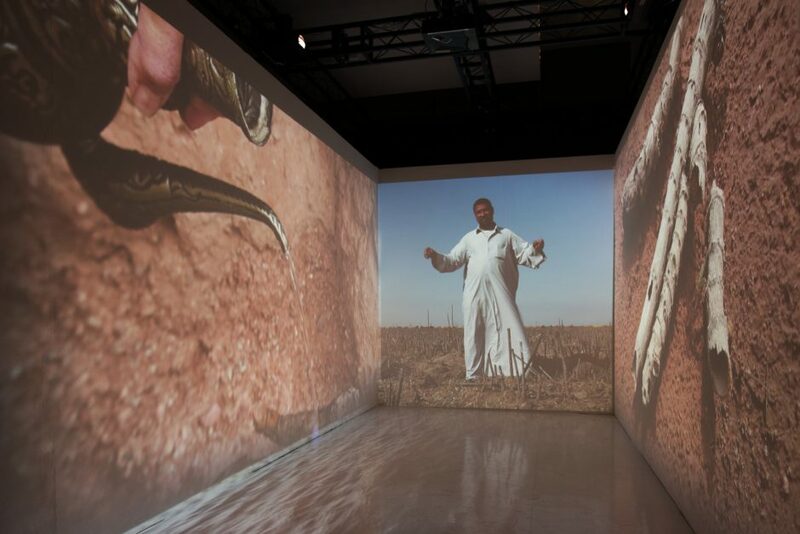 The video installation proposed here, Eden In Iraq: In The Marshes, while not featured in the UNM exhibition is part of the third ongoing section of this exhibition, Eden in Iraq. Currently Meridel is co-designing a wastewater garden in the Mesopotamian marshes of S. Iraq in the vicinity of the probable location of the historic Garden of Eden that will be a water remediation and memorial public art site. A traveling exhibition to document this project, Eden in Iraq, including models, photoworks, and the video installation In The Marshes opened at the National Design Center in Singapore in fall 2017. May 31, 2018, the New Mexico Museum of History will present the solo exhibition Atomic History IES,with the two video installations from the series Critical Mass 1991-95: The Meeting and Oppenheimer’s Chair. Meridel has received fellowships from the Guggenheim Foundation and Harvard University, awards from the National Endowment of the Arts, the Pollock Krasner and Rockefeller Foundations. She was educated at Sarah Lawrence College in New York and did special graduate studies at M.I.T. with the eminent photographer, Minor White. She received an M.A./M.F.A. from the University of New Mexico, Albuquerque, in 1974/1977, Meridel’s 20 year monograph, BELONGING: Los Alamos to Vietnam, Photoworks and Installations 1980-2000, was published by St. Ann’s Press in Los Angeles in 2004, with texts by environmental writer Terry Tempest Williams and cultural and art critics: Lucy Lippard, Elaine Scarry, and Rebecca Solnit. James Crump, curator, publisher, and filmmaker wrote the biographical text.